Financial services companies are engaged in a never-ending battle with guerilla fraudsters who are expert at probing for holes in company defenses. Generally, the companies possess the big weapons in the form of powerful computing and sophisticated prevention and detection processes that have evolved over time. But the changing environment has offered the fraudsters some tactical advantages and stiffened the challenge. Massive, rapidly accumulating volumes of uniquely structured data - much of it gathered from new opportunities to interact with customers - have opened new ground for fraudsters to exploit, even as the sheer volume has made it easier for them to hide. 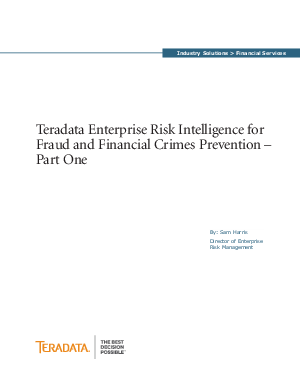 Conventional approaches to fraud detection and remediation remain effective to a point, but conventional tools simply cannot effectively and economically process what is known as big data.